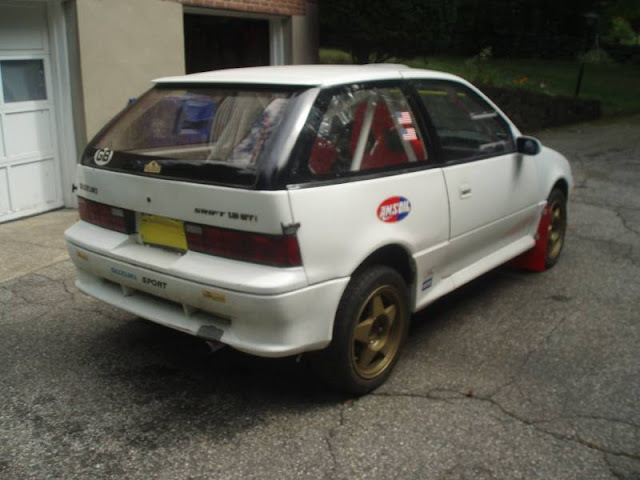 The Suzuki Swift/Geo Metro/Chevy Metro/Pontiac Firefly (sold from 1988-1999) was a subcompact hatchbox from General Motors with powertrain developed by Suzuki and the build quality of toy from the 99 cent store. The Swift wasn't swift in the least bit, but it was available with a 5 speed manual transmission, fully independent suspension and a super light 1600 lb curb weight...so it makes a great rally car. Find this 1989 Suzuki Swift GT MK2 Rally Car offered for $6,000 in Norwalk, CT via hemmings. Tip from BP. 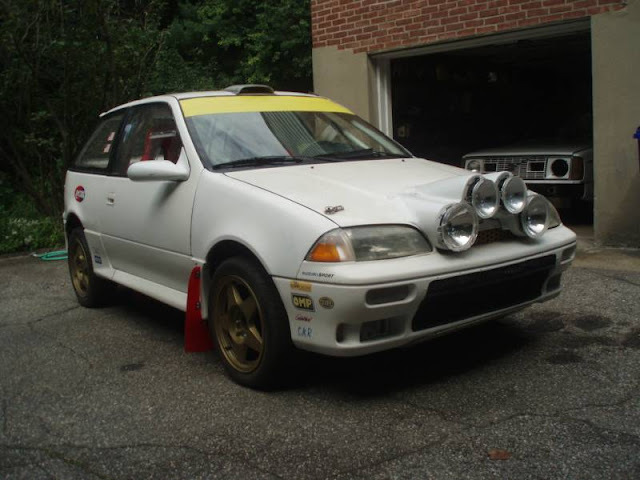 1989 Suzuki Swift GT MK2 Rally Car, 16 Valve Twin Cam, Gravel Spec., Full cage, Aluminum Skid plate, Lexan windows, 5 speed, new centerforce clutch, Limited Slip, New fuel tank and fuel pump. Hawk brake pads. Urethane motor and transmission mounts, new Sparco seats with 5 point harnesses, custom exhaust and suspension, car weighs 1,750 lbs., 8-Compomotive 15x7" wheels; 4-Speedline 14 x6" wheels; 32,000 miles on replaced engine in 2013. Many spares -2 extra engines, transmissions, axles, front brake calipers, front and rear control arms. Many, more spares (too many to list, call for details). I have owned car for 21 years. SCCA Logbook. Car has done occasional RallyCross and RallySprint. Located southwest Connecticut. Call for details. A friend once tossed me the keys to a Geo Metro with a five speed and it was way more fun than it had any business being. Suzuki had a factory rally team and ran the first gen Swift (Cultus) in the WRC. They made an appearance at the 1986 Olympus WRC and I snapped a picture of one of their cars. Jean Lindamood from Car & Driver was a guest co-driver. That is her on the right.